Many thanks to the editors at Guitar International for their interest in publishing my recent review of Milton Nascimento e Banda at the Barbican in London on 20 October 2013 as part of Milton’s tour 50 anos de Carreira – Uma Travessia [50-Year Career – A Taverse]. As published in Guitar International, 2 December 2013. 2013 has been one of celebration for Milton Nascimento. Besides celebrating his 71st birthday on 26 October, Milton has been commemorating his 50-year career as a musician that began with the EP Barulho de Trem recorded in Belo Horizonte in 1963. If the London installment of Milton’s tour 50 Anos de Carreira—Uma Travessia [50-Year Career—A Traverse] is any indication of his vibrancy, then I expect to see many more commemorations to come. After a captivating performance by the performer-composer Siba from Pernambuco state in northeastern Brazil, the audience murmured with anticipation while the crew changed the stage to receive Milton Nascimento and his band. Much of this buzz was in Portuguese—in the lobby, in the ladies’ bathroom, and from my own friend from Lisbon who joined me for the concert. A mug sat prominently on a stool next to Milton’s microphone showing his own drawing of the mountains from his own state Minas Gerais that also adorns the cover of the album Geraes. Album cover from Milton Nascimento’s 1976 release Geraes, featuring his artistic rendering of the mountainous landscape of Minas Gerais state. Many shouted along with the band’s punctuated accompaniment to the word, “Vamos! [Let’s go! ]” It struck me that such socially conscious song is as relevant in today’s democratic Brazil, rife with political dissatisfaction and social protest, as it was in the dictatorial Brazil of the 1970s. Guitarist and musical director Wilson Lopes, Milton’s constant companion since first working together on Angelus in 1993, provided sensitive accompaniment on “Cais [Quay]’, one of Milton’s best-loved songs. Fans and journalists alike have recently criticized Milton for not using as much falsetto as he once did or for the occasional out-of-tune notes at the extremes of his range, but I feel that these critics are missing the point. Milton’s voice is still quite strong and rich, and it is the conviction with which he sings that is most beautiful: “Eu quero mais! [I want more! ]” For the famous closing theme, pianist Kiko Continentino left his perch allowing Milton to take over the grand piano. Drummer Lincoln Cheib—a joyful performer and attentive collaborator—helped build anticipation first with the toms, then with the full drum set until the group reached a bombastic peak. Kiko’s lush piano accompaniment segued directly into “Vera Cruz.” First recorded on the album Courage in 1968, the session was held at the legendary Van Gelder Studios in New Jersey alongside jazz legend Herbie Hancock and Brazilian arranger and organist Eumir Deodato. As a young jazz singer in Michigan, this was the first song I ever heard by Milton Nascimento. For my generation of jazz musicians, it has remained a fervent favorite, and it is no wonder why, after witnessing the exuberant solos by saxophonist Widor Santiago and each of the band members in their turn. Another strong theme in Milton’s music is that of fraternity and friendship. The medley of the songs “Clube da Esquina” and “Clube da Esquina No. 2” by Milton and Lô Borges celebrated his lifelong friendships with the collective of musicians that became known by the name Clube da Esquina [Corner Club]. The latter song became perhaps most poignant as Wilson and bassist Gastão Villeroy contributed backing vocals for the first time, while Milton performed lyrics that play with the sound of repeated words. Speaking at first about childhood friendships, then adult friendships, the lyrics eventually expand to include the universal friend, that is, Milton’s fans from all over the world: “Quero ver então a gente, gente, gente, gente, gente … [So I want to see the people, people, people, people, people].” Raising his arms in offering to the crowd, ecstatic cheers from the audience confirmed that the sentiment was reciprocated. Milton Nascimento e Banda at the Barbican, October 20, 2013. Pictured from left: Kiko Continentino (piano, keyboards), Widor Santiago (saxophones), Pedro Nascimento (vocals, cavaquinho), Gastão Villeroy – obscured (electric bass), Lincoln Cheib (drums, percussion), Milton Nascimento (vocals, guitar), Wilson Lopes (musical director, guitar). The rest of the show was peppered with crowd pleasers, favorites for the connoisseur, and an obscure gem. Milton’s gypsy samba in ¾ time “Cravo e Canela [Clove and Cinnamon]” got the crowd to groove and sing, but the band also showed appealing versatility by ending with a stripped-down, bluesy and gritty version at half tempo. Another crowd favorite came in the form of the psychedelic rock song “Fé Cega, Faca Amolada [Blind Faith, Sharp Knife],” a song rarely played by Milton in live shows. Faltering slightly on the falsetto melody, the song once helped launch the career of fellow performer-composer Beto Guedes when they shared lead vocals on its 1975 recording. For the connoisseur, Milton played a lovely instrumental medley in dedication to his mother Lília. Adopted at an early age by Josino and Lília de Brito Campos, Milton described her influence on him as inestimable: “You can look for … [his English falters] poesia … o que é que é poesia? [he asks the audience what is it that is poetry? someone answers] … poetry, books, the world. Never you gonna find something as beautiful as my mother. She is the goddess that made me a musician, a person, everything.” The wordless theme “Lília” is perhaps not what one might expect of a doting son. Rather than a sentimental ballad, we hear something more akin to film music—perhaps cowboys crossing the vastness of the sertão [Brazilian hinterlands] at a punishing pace. The real demonstration of the fandom present at the Barbican came when he asked the audience to sing to him. He has been making this request of audiences for the past few years, and London did not disappoint. If somewhat bashfully, one could hear “Canção da América [Song of America]” from beginning to end. Though composed in Los Angeles, for many the song is an homage to Brazilian friendship (the first line sings, “Amigo é coisa pra se guardar debaixo de sete chaves [A friend is something to be kept under seven locks and keys]”), for others an analogy for shared struggle and oppression throughout Latin America. Perhaps in the Barbican, the best metaphor was one of a friendship that can dissolve the constructs of nation, borders, and cultural difference. Surely, one thing Milton best demonstrates is the power of music to unite and delight. Author’s Note: Milton Nascimento recently donated thousands of items from his personal archives to be shown on digital display at the Jobim Institute in Rio de Janeiro. Music fans can stream many of his albums for free: http://www.jobim.org/milton. Follow the link to the website, click on Audio and Video, then scroll down to the album covers and choose from more than 30 recordings released throughout Milton’s long career. 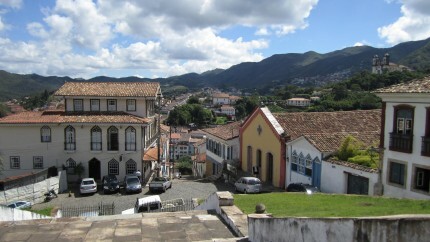 Monday morning, Jaimie and I arose to squeeze in a bit more historical tourism in Ouro Preto. We climbed the ladeira up to Praça Tiradentes. On the way, I took this picture of an oratório perched on a corner overlooking a steep valley. (Note: an oratório is a structure constructed for personal worship and prayer. It ranges in size from one wall of a room, to a portable chest, to a medallion worn around the neck. Click here to visit the photo gallery of the Museu do Oratório in Ouro Preto to see examples). 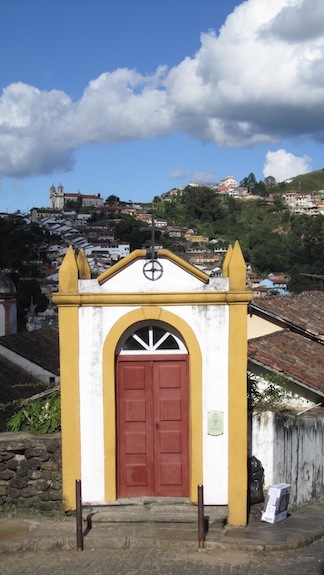 The small plaque to the right of the double door explains that this oratório—Passo de Antônio Dias—is one of five remaining in Ouro Preto. 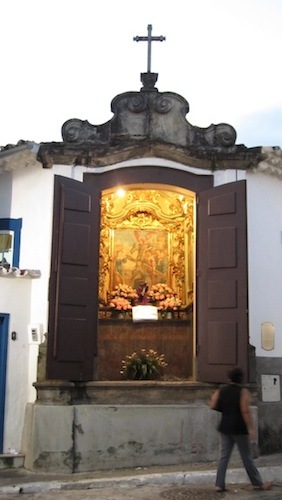 It opens only during Semana Santa (Holy Week), specifically during the Processão do Encontro on Domingo dos Ramos (see my prior post), the Processão do Enterro (Procession of the Interment of Jesus Christ), e Sexta-Feira Santa (Good Friday). Looking back at my photos after the trip, I realized I had snapped a picture of that same oratório the day before—on Domingo dos Ramos (Palm Sunday). What luck! 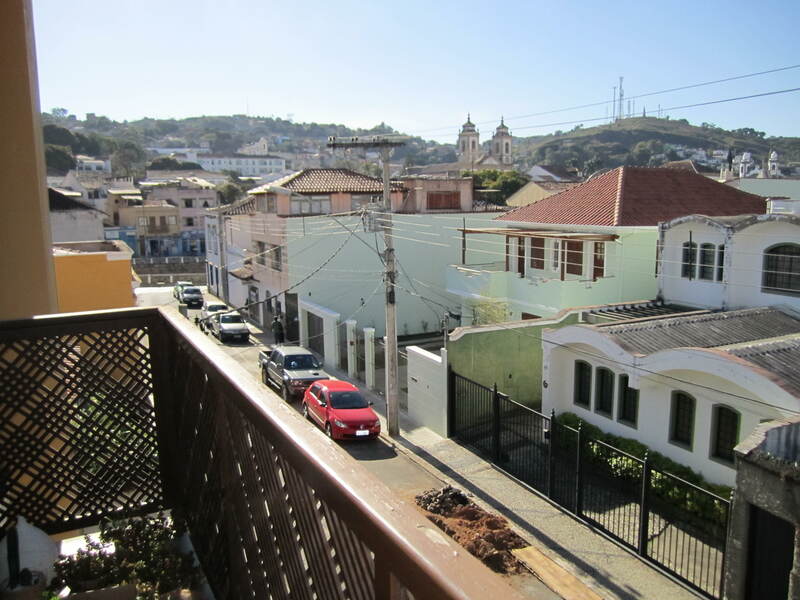 I remember having watched ouropretanos (residents of Ouro Preto) pass by, pay their respects, and resume the quotidian, such as running errands, shopping, visiting relatives. This aspect of individual spirituality fascinates me. Historically, it seems to have arisen out of colonial necessity. Portuguese settlers simply couldn’t build churches fast enough, especially not in the remote, mountainous state of Minas Gerais. But, portable oratórios helped keep people invested in the Catholic Church. 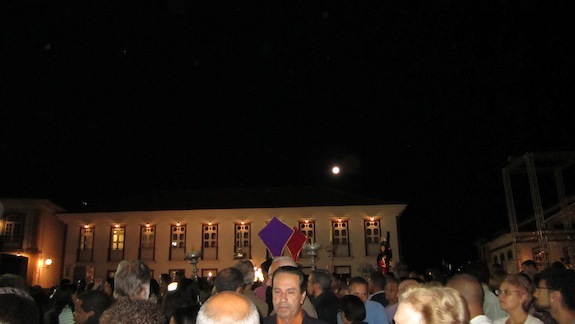 Here are two more oratórios that opened during the evening processionals of Semana Santa (Holy Week). Monday evening, Jaimie and I parted ways. She returned to Belo Horizonte to continue her biological research on tadpoles (so neat! ), and I took a bus to São João del Rei. The next morning, Domingo dos Ramos (Palm Sunday), Jaimie and I awoke early in order to participate in another processão. This one was to depart the beautiful Igreja de São Francisco de Assis—the church that uses the second largest amount of gold in its interior design in Brazil (the first is in Salvador da Bahia). We heard ringing church bells as we showered and prepared to leave, but when we arrived at the church, it was empty. 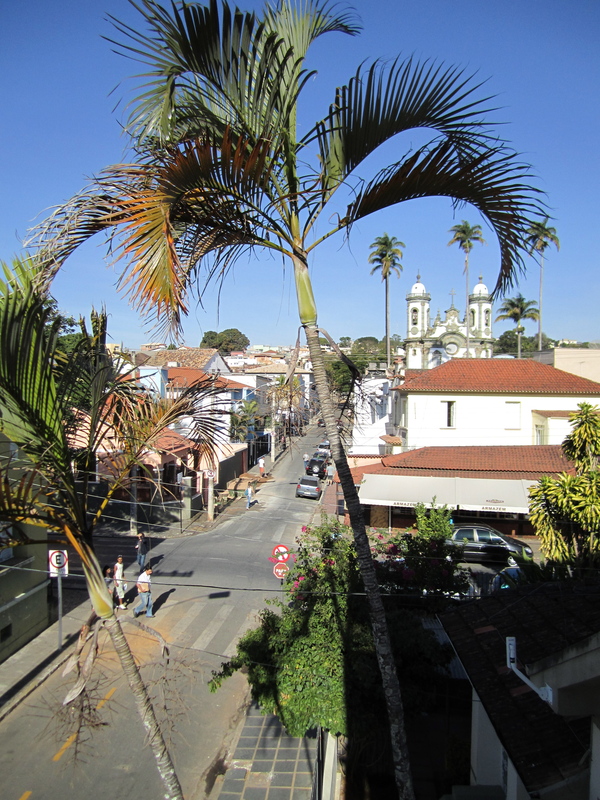 Despite local advertisements, the processão had already departed before 8 am! We asked some locals and discovered that we could walk a few short blocks and find a mass in session. We did so, and took part in the blessing of the ramos, or palms. A choir sang accompanied by an ad hoc group of instrumentalists—flute, trumpet, organ, a few clarinets. After the mass had concluded, I spoke briefly with a few of the singers. When they found we were Americans, they seemed very excited that we would be interested in the church music, and shared their personal experiences. A woman in her thirties said she had only been in the choir for a year and learned mostly by ear, but that she hoped to learn how to read music. The choir director, a man in his early fifties, had been with the church for thirty years, and was proud to be able to keep the music going as part of religious services. The elder member, a man in his late sixties, complained that cell phone use during services was becoming all too common. He also ridiculed local politicians for having closed a government-funded music school in the area, the only option for those of modest means to access music education. As we happily chatted, the elderly man explained that his voice felt very hoarse that day and not to judge him too harshly. 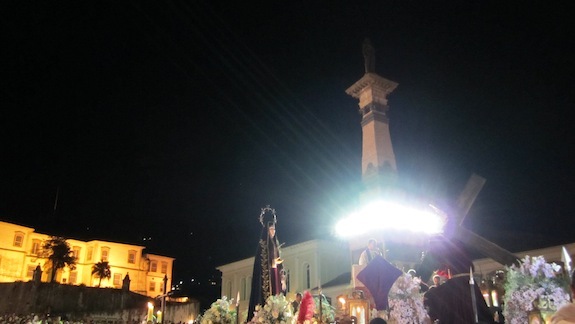 Then, he told us that we couldn’t miss the evening processão which would feature the Cerimônia do Encontro, a reenactment of the meeting of Mary and Jesus Christ as he entered Jerusalem on Palm Sunday. We promised to be there. 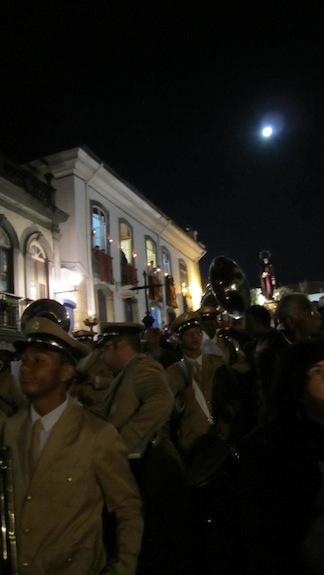 After a full day of visiting historical sites of Ouro Preto, Jaimie and I struck out to find the evening procession. I had read conflicting information about where the processão would begin, but when we saw an elderly trombonist in a marching band uniform, we knew he would lead us in the right direction. Trombonist heading to the processão. The windows in the distance are decorated with red banners in honor of Palm Sunday. We arrived at Praça Tiradentes—the central town square—just before sunset. We found an empty curb in view of the temporary stage set up for the occasion and watched the crowds slowly gather. My favorite scene is of a young girl in an angel costume being photographed by her adoring grandfather. He snapped picture after picture in front of the setting sun as the I-know-I-am-adorable-but-I-will-pretend-I-don’t-notice-all-of-the-people-watching-me girl gave smile after smile. The sun set. 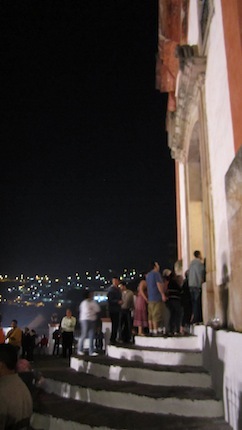 The humming crowd of over one thousand quieted and an hour-long sermon commenced as the moon slowly rose over Praça Tiradentes. I marveled at the silent attention this huge mass of ouropretanos gave to the impassioned guest bishop. Only the sounds of fidgety children could be heard and the occasional hum and creak of a passing car. The priest gave particular attention to Mary, or Nossa Senhora das Dores (Our Lady of Sorrows), explaining the significance of this encounter and the pain she would endure at the impending loss of her son. Mary’s significance for this priest was as a metaphor for the pain and suffering of motherhood and a reminder for ouropretanos to honor the matriarchs of their families. As the priest spoke, two wooden images squeezed their way through opposite sides of the crowded square. Each dais was accompanied by costumed sentinels in Roman dress and a band of brass, winds and percussion. As the priest spoke, the images neared closer and closer until his passionate speech reached a peak and the images met face to face. The priest closed his speech, hundreds clapped, and the processão began. Jaimie and I were unprepared for what followed. 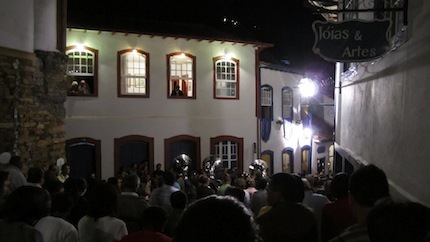 The processão wound through street after street, over a river, past warmly glowing restaurants, solemn-looking churches, and many open windows. The two bands following each wooden image traded off playing hymns throughout the 3-hour journey. After snapping pictures of the happy but tired musicians, Jaimie and I found our way back through the winding streets to eat a quick dinner and collapse into bed. The next morning we awoke feeling like old women—our legs ached, we limped around our little pousada room, and only long showers could prepare us to climb the ladeira for our last day in Ouro Preto. One of my goals here in Minas Gerais has been to try to get a broad understanding of the types of cultural production that involve music-making. Though my research focuses on the Clube da Esquina—a musical collective often categorized as MPB (música popular brasileira)—I am devoted to investigating the many musical manifestations in Brazil and Minas Gerais that influenced their output. One of those influences comes from Catholic religious celebrations. 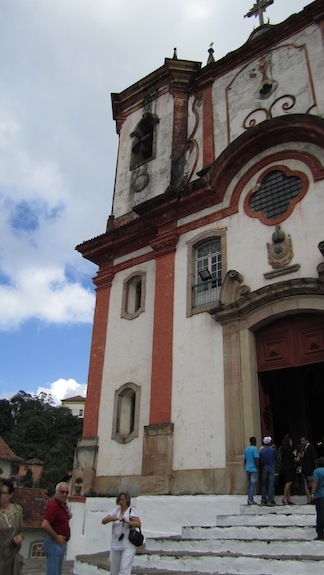 During Semana Santa (Holy Week), I traveled to two colonial cities in Minas Gerais in order to learn more about the importance of Catholicism in civic life. 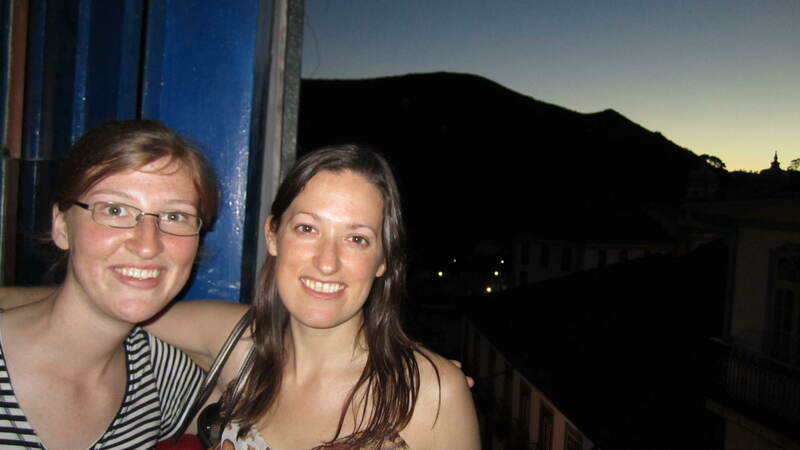 First, I took my dear friend Jaimie to Ouro Preto. 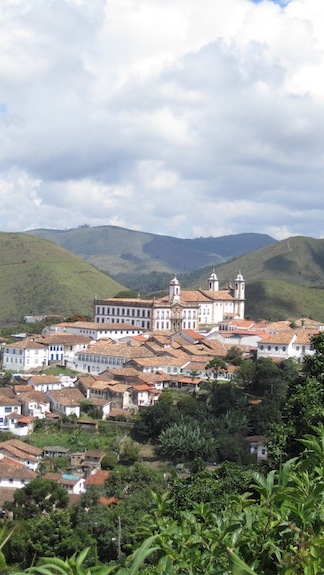 Ouro Preto celebrated its 300th anniversary this year (1711 – 2011). 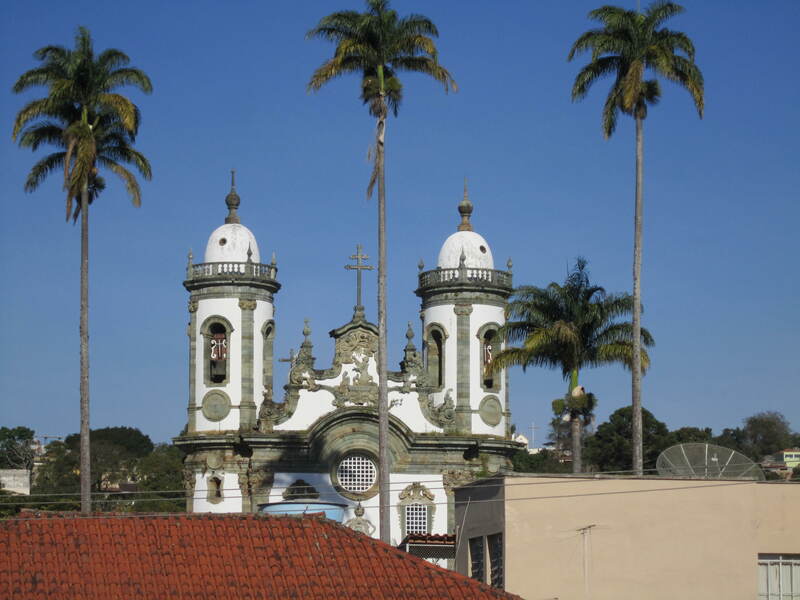 Its original name was Vila Rica (Rich Village) due to its status as the center of Brazil’s gold rush and was the capital of Minas Gerais for much of the 19th century, well before Belo Horizonte (the current capital) was constructed. 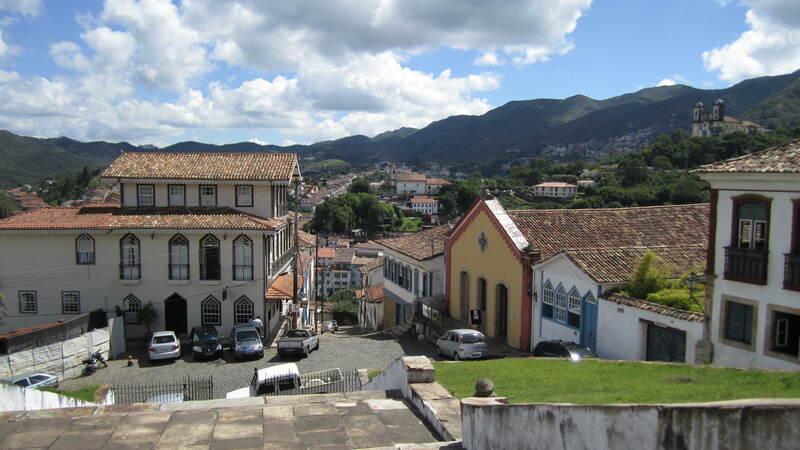 Today, Ouro Preto teams with domestic and international tourists, stumbling through the many ladeiras (steep streets; or literally, ladders) to museums, churches, and shops. 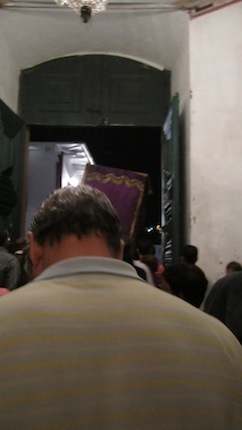 Although Jaimie and I ventured into museums and a few shops, my willing assistant accompanied me on at least three of the many processões (processions) scheduled throughout Semana Santa. We arrived on Saturday afternoon, the day before Domingo dos Ramos (Palm Sunday). 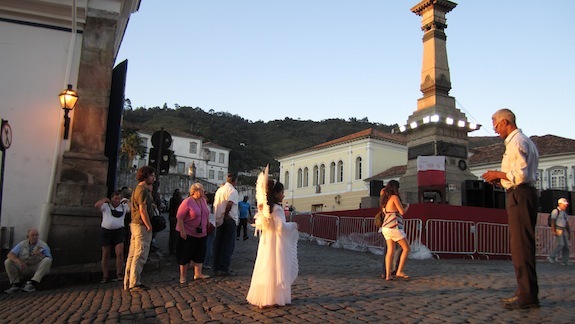 After checking into a modest, but very well-kept pousada (bed and breakfast), we climbed our way back up to Praça Tiradentes (the central town square) in search of the first of many processions. We wandered down a few winding streets and found the Matriz Nossa Senhora do Pilar (head church, or also womb, of Our Lady of Pilar). At 7 pm, the church was already overflowing with a softly buzzing swarm of worshippers. 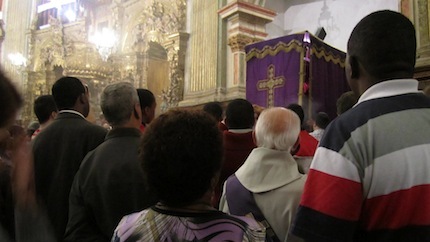 The priest gave a brief sermon introducing Holy Week, and then unveiled a wooden image of Jesus Christ inside of a purple-cloaked dais. 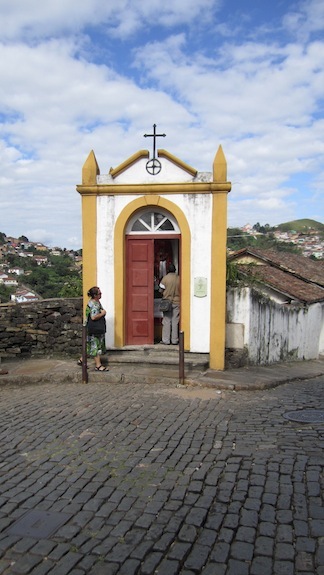 The churches in Ouro Preto share the responsibility and honor of hosting the images of Jesus Christ and Mary. 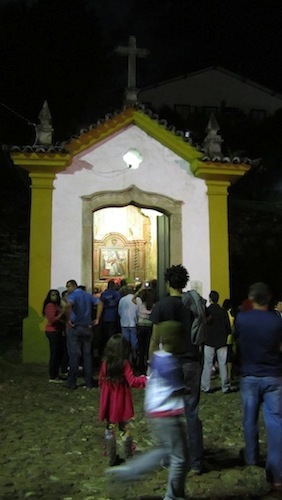 This night, the image of Jesus Christ was carried through the steep and winding streets of Ouro Preto to arrive at Santuário da Imaculada Conceição (Sanctuary of the Immaculate Conception). 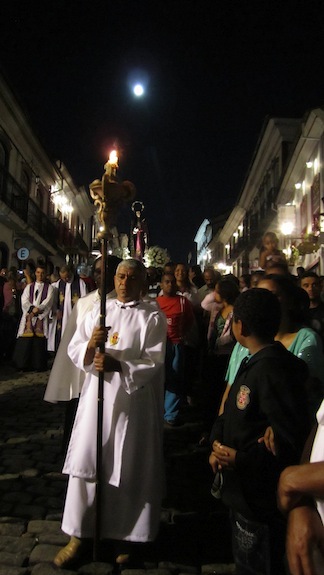 Church volunteers carried the dais while followers filled the narrow, cobbled streets from door to door. 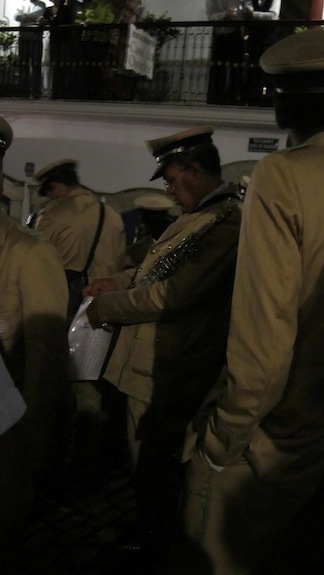 A city band in navy uniforms accompanied the procession playing religious hymns. 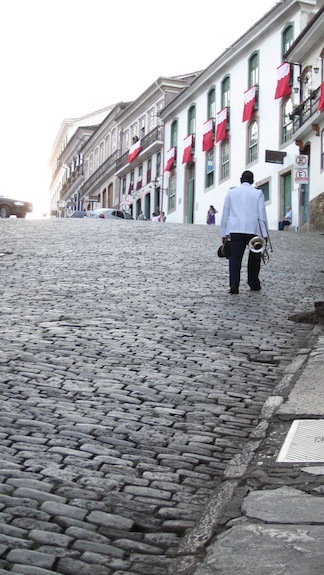 Marching over the uneven ground at night and reading the sheet music attached to the musician’s backs certainly made for challenging music-making (and photography—my apologies), but ouropretanos are used to scaling these streets. Two things particularly struck me about this event. 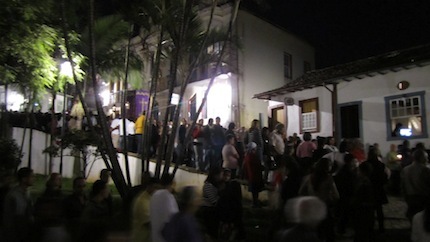 First, the processão seemed to be an event for generations to gather together. 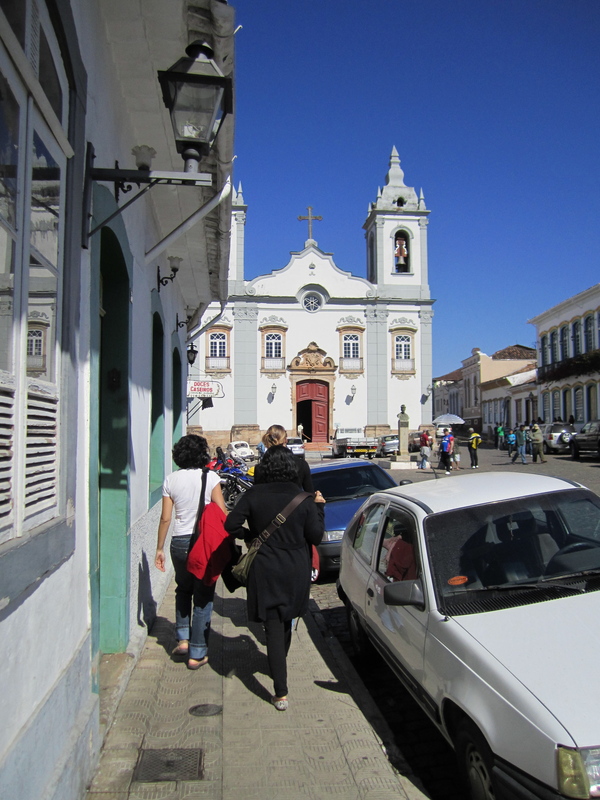 I saw granddaughters assisting very elderly grandmothers over the cobblestones, nephews walking with uncles, and parents greeting children arriving from other cities in Minas Gerais who had come home for the holiday week. Second, despite these encounters, the followers were solemn. Mineiros (residents of Minas Gerais), and brasileiros in general, greet family and friends with enthusiasm! But, this night was muted and reserved for an internalized religiosity. My subsequent travel to São João del Rei would be a very different experience. 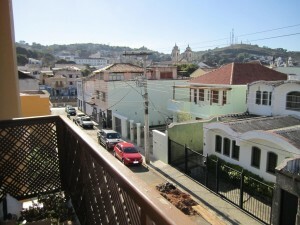 I spent the second week of my trip to Minas Gerais, Brazil (third week of June 2010) living with Carol’s husband at his house in the mid-sized city of São João del Rei located 200 kilometers south of Belo Horizonte. Guilherme is a professor of guitar at the Universidade Federal de São João del Rei and proved to be an excellent host and we had several helpful discussions in the chilly June evenings. While Gui taught private lessons and classical guitar history classes during the day, I took the opportunity to research, watch World Cup futebol and explore the city by foot. We arrived Monday morning, June 21st and after Gui departed for work, I tried to capture the central location of his apartment within the city. Visually, Gui’s apartment is surrounded by 7 different Catholic churches. But physical geography is not the only interest here–the sonic geography is truly captivating. Each of these churches, as well as several others not pictured, has a bell tower, and over the years (centuries, in fact), they have worked out a system in which each church takes turns ringing out its messages to the city. Saturday evening became a favorite time for me to sit in Gui’s apartment and simply absorb the soundworld of secular weekend street life mixed with the sacred bells. Gui explained that the bell ringing repertoire has been studied by several musicologists, and after a few nights, it became apparent that the diverse sounds emanating from these churches deserved the attention. Gui told me that some churches had developed a system of ringing by which church-goers could discern important news. For example, researchers claimed that church-goers could hear in the ringing that not only had a fellow worshipper died, but could hear in the sound the age, gender and disposition of the person to such accuracy that many could conclude the identity of the deceased! Another style of ringing required collaboration between a pair of churches. One evening, after a series of what I would describe as typical bell-ringing from 2 or 3 churches, I began to hear 2 bells of different pitches ring out in short, crisp and syncopated rhythms–a very different sound from the typical long and droning tones of the previous churches. After about 30 seconds, I realized that two ringers were imitating the agogô bells–two tubes of metal ringing with one high and one low pitch–often heard in many styles of samba music! Incredible. When I tell people I am going to Brazil, they always respond with jealous comments about the time I will spend on the beach. Maybe it was my landlocked Midwestern upbringing, or my dangerously pale skin, but I am just not seduced by beach life. Instead, I head straight to the third largest city in Brazil. 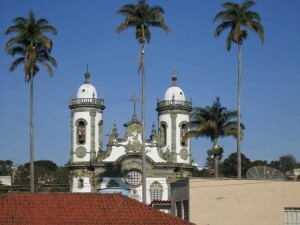 Belo Horizonte sits in a valley in the mountains of the Southeast, an 8-hour bus ride North of Rio de Janeiro. This past June and July, I spent two lovely months escaping from the oppressive heat and humidity of central Illinois in Beagá (Portuguese for BH). Winter in Beagá is fantastic—75 or 80 during the day, 50 at night and sunny every day—perfect for Northerners like me and my Canadian husband. I first went to Beagá in 2003 and fell in love with the giant intersections of downtown, labyrinthine streets of the suburbs, and, most of all, the people. I stayed four months in 2004-05 and discovered mineiros (residents of Minas Gerais state) to contradict the stereotypes assigned them by other Brazilians. My next few blog posts will be dedicated to describing my experiences in Belo Horizonte—if you have any comments or questions, shoot them my way!